London School of Marketing (LSM), one of UK’s leading private course providers, is looking for a partner to open a regional centre in Brazil. We are really open to working with partners from either the world of business or education, as long as they have the ability to provide us with the space and technology needed, we are happy to come to an arrangement. As an associate college of the prestigious Anglia Ruskin University and the University of Northampton, London School of Marketing (LSM) provides accredited marketing and business qualifications. The courses are conducted via Blended Learning by highly experienced lecturers. 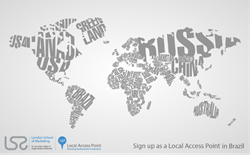 With the aim of removing boundaries to education, LSM developed the concept of ‘’Local Access Points’’ (LAPS) in 2015, and since then, the School has come a long way by building a global network of partners to help promote their courses. This innovative educational model allows students to obtain internationally recognised qualifications from their own countries, thus allowing them to avoid travel costs and immigration hurdles. Professionals looking to boost their careers can study without leaving their current jobs. Courses awarded by Anglia Ruskin University are the BA (Hons) in Marketing, BA (Hons) in Business Management, Master’s in Marketing and Innovation, Master’s in Business Administration. LSM also offers the following programmes; Master’s in Human Resource Management, Master’s in Accounting and Finance, LLM International Commercial Law, BSc (Hons) International Accounting and Master’s in Business Administration, which are awarded by the University of Northampton. The concept has been an immense success and LSM now has a vast number of students from different nationalities, studying under LSM’s trusted brand name. Over 3000 international students attended the School’s graduation ceremony in the UK last year. LSM is now looking to venture into Brazil to expand their operations. They are looking for an entrepreneurial partner with knowledge of the local student market to provide the school with space for 10-15 computers, fast secure internet access and meeting room facilities. The courses are offered at very competitive prices and the qualifications obtained could mean a significant step in starting or furthering the applicants’ careers. LAPs can benefit from relatively low set-up costs, as well as full support and training from the administrative and marketing teams at LSM. Students residing in Brazil stand to gain a lot by studying for a British degree, since the academic excellence of British education is recognised world-wide. Furthermore, English is the most recognised language in global businesses, so students can improve their English language skills while completing their higher studies. Anton Dominique, Chief Marketing Officer at London School of Marketing shared his thoughts: ‘’There is a strong and rising need for quality higher education in Brazil. Education is one of the key contributing factors to economic development, by way of improving the quality of life, bringing about technological advances and promoting entrepreneurship.